An ideal therapy that speeds up recovery and cures various indications causing acute or chronic pain. Shockwave Therapy triggers your body’s natural healing response to get you back in the game fast. Shockwave therapy is a multidisciplinary device used in orthopedics, physiotherapy, sports medicine, urology, and veterinary medicine. Its main assets are fast pain relief and mobility restoration. Together with being a non-surgical therapy with no need for painkillers makes it an ideal therapy to speed up recovery and cure various indications causing acute or chronic pain. It is a low intensity extracorporeal shockwave therapy. Shockwaves are acoustic waves that carry energy and can be focused to affect targeted distant tissues where low intensity focused waves interact and produce micro-trauma which results in the release of angiogenic factors (essential for healing, growth, and development). Angiogenic factors helps in neovascularization (natural formation of new blood vessels) of the targeted tissues which in turn improves the blood supply ad healing. Acoustic waves with high energy peak used in Shockwave therapy interact with tissue causing overall medical effects of accelerated tissue repair and cell growth, analgesia and mobility restoration. All the processes mentioned in this section are typically employed simultaneously and are used to treat chronic, sub-acute and acute conditions. For erectile dysfunction, this treatment helps clear vascular plaque, create new blood vessels and recruit growth factors. 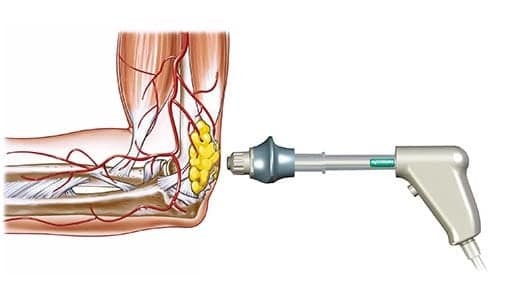 Shockwave is an acoustic wave which carries high energy to painful spots and myoskeletal tissues with subacute, subchronic and chronic conditions. The energy promotes regeneration and reparative processes of the bones, tendons and other soft tissues.Shockwaves are characterized by jump change in pressure, high amplitude and non-periodicity.The kinetic energy of the projectile, created by compressed air, is transferred to the transmitter at the end of the applicator and further into the tissue. Most patients will experience pain relief and increased range of motion (joint treatments) following the treatment. Within 2–4 hours after the treatment, they may experience some soreness in the treated area. This soreness has been reported as tolerable and resolving within 24-72 hours. It depends on the treatment area and tissue being treated. Typically 3-6 treatments are required and spaced from 3 days to 1 week apart.